WHOLE FOODS? CHEMICALS? or SOMETHING IN BETWEEN? Whole, Unprocessed, Organic Foods offer the Best Nutrition for Healthy Bodies and Healthy Microbiomes. 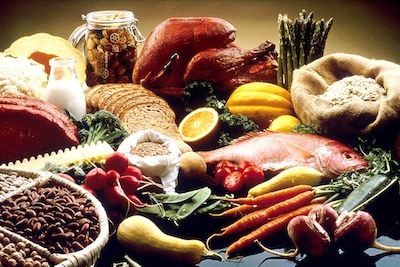 People are waking up to the awareness that eating whole, unadulterated foods is a good idea. We are beginning to understand that only whole foods offer the biocomplexity (the diverse mixtures of ecologically balanced biochemical and nutrients) needed to sustain healthy bodies and functional microbiomes. The problem many people face today is that when it is necessary to use processed or packaged foods, it can be challenging to distinguish between whole foods, extracts or other preparations derived from whole foods, and added chemicals. The goal in choosing whole foods should be to maximize whole foods and minimize chemicals. Extracts and other preparations derived from whole foods can fall anywhere between the two categories, with some extracts being quite complex and balanced, while others are pure enough to behave as synthetic chemicals. If you must use extracts, learn to pick extracts that retain biochemical complexity. Avoid purified chemicals completely. What standard nutrition labels won’t spell out for you is whether an individual ingredient is a whole food, an extract from a whole food, or a chemical. One reason they won’t tell you this is because the boundary between these categories is not very distinct. Processed foods are almost always mixtures of whole foods, extracts of foods, and chemicals. Whole foods and whole food supplements will have the greatest biocomplexity. Added chemicals (which may be naturally occurring or man-made) will offer the least. The generalizations below are not carved in stone, but they offer general guidelines that can help you distinguish whole foods from other ingredients found on food and supplement labels. Most of us easily recognize common dietary staples, such as beef, apples, mushrooms, corn, or fish as whole foods. Difficulty arises when we encounter packaged foods with ingredients whose names we can’t pronounce. If you are lucky, the manufacturer included the scientific name on the label (Panax ginseng or Chlorella vulgaris). When present, the Latin words in the scientific names (eg. Chlorella vulgaris) give you an immediate clue. Scientists give all identified plants, animals, fungi, and microbes a Latin binomial (a name with two words) to represent the genus and species living things belong to. So when you see two words in Latin representing a single ingredient on a packaged food or a supplement label, the odds are good that you are looking at either a whole food or an extract from a whole food, rather than at a chemical. Beware, however, of apparent “binomials” that contain “acid”, as a word or -ate, –ide, -ite as suffixes. More on this under added chemicals. Of course, identification of food items you are not familiar with becomes harder if the label doesn’t show the scientific names. Fortunately, we live in the information age, so when all else fails, so if you really want to consume a food with ingredients you have never heard of, you can always Google it to learn more. Extracts or Natural Product Preparations Derived from Whole Foods. Extracts and Natural Product Preparations constitute an enormous grey area because some extracts, like essential oils, retain sufficient biocomplexity to promote balance. For example, a typical essential oil (an extract) may contain hundreds of unique compounds that co-evolved within a plant in ratios compatible with living cells. Other extracts can become so purified that only a single chemical or drug remains. Think of sugar, corn starch, or even cocaine. Purification decreases the nutrition and increases the potency and the toxicity of a compound. For example, a coca leaf (a whole food/herb), is less potent and more nutritious than cocaine (a coca leaf extract and a toxic drug). Highly purified substances can disrupt metabolic balance within your cells and within your microbiome. Since extracts can run a broad spectrum, ranging from mixtures with remarkable nutritional or biochemical complexity to highly purified compounds, like sugar or corn starch, the term “extract” on an ingredient list, while perfectly legal, does not provide enough information to help you assess whether the ingredient has the biocomplexity and balanced proportions that support microbiomes. Unfortunately, this may be all the information you have access too. Our labeling laws were simply not designed to help us think holistically about food. If you are dealing with a transparent company, you can call their customer service to find out more about their extraction process. When choosing products that contain extracts, look for those that retain biochemical complexity (ex: choose dehydrated cane juice over white sugar). To support balanced nutrition and a healthy microbiome, minimize exposure to any chemical that has been added in ratios differing from those found in whole foods or natural living systems. This obviously includes reducing exposure to drugs, chemical preservatives, and pesticides, but it also includes reducing exposure to compounds you might currently view as a food or a nutrient, like white sugar or ascorbic acid (aka Vitamin C). Because chemicals are often added in soluble forms, they can often be identified on package labels by the word “acid,” or by suffixes like –ide, -ite or –ate. For example, pantothentic acid, magnesium citrate, niacinamide, and monosodium glutamate are all chemicals that can be found on food or supplement labels.